I was really looking forward to starting E. Lockhart’s We Were Liars, as it seems to be one of the more popular upcoming releases this year. I can’t say that the book was exactly what I was expecting, but it did make for a pretty enjoyable read. I’m going to try to write this review as vaguely as possible, as to not give away any spoilers. I want to start off by saying that there is a LOT of characters in this novel. I had to put forth a bit of effort to keep up with everyone. A few characters stood out more than the rest, but for the most part, most of them were really unlikable. It was kind of awkward reading the story through the main characters viewpoint, as she was pretty confused about everything that was going on herself, but I think that added a lot of the mystery to the book. The writing style was really different and unique—almost poetic, in a way. The storyline was very dark and addictive; I couldn’t stop reading because I HAD to know what happened to the main character, and what the family was keeping from her. I dove into this story not really knowing what to expect, especially after reading the somewhat vague synopsis. That, however, was probably a good thing, because the story definitely kept me guessing all throughout the pages. The ending of the book was a bit of a shocker. It was pretty much the opposite of what I was expecting to happen, although now that I think back, I totally should have seen it coming. The ending did feel a bit abrupt, but I’m thinking that the author may have wanted it to be that way for a particular reason. I think the one thing that I really enjoyed the most about the story was the setting. How awesome would it be to have your own personal island, and everyone in the family has a house there. That would be really cool, as long as I got to pick which family members lived on the island. Haha! 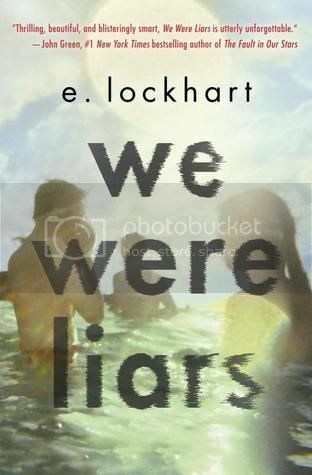 Overall; if you are into mysterious, thriller type reads, then you should definitely check out We Were Liars. I think a lot of people will really appreciate the unique writing style, and the super mysterious storyline. I am SO intrigued by this book. I've seen it a lot lately around the blogosphere and I have to give it a try. Great review! Yeah, I think the lack of knowledge of what's going to happen is definitely a plus, because I just wanted to know all about this world. I think that it actually worked and I love that it worked. I wish the characterization was more developed but I actually didn't mind too much because the story seemed to flow. Lots of characters, then? It seems a bit hard to keep up with everyone. But I'm interested in the poetic writing and want to experience reading it for myself. Thanks for the great review! The amount of characters didn't bother me in this one, but the lack of distinguishing feature for all of the characters was what made it slightly difficult for me. Like her cousins and stuff. I couldn't remember who was who and which one was which age, etc. haha! I really was in love with this book, though!